Wampum, ke`kwuk, squau-tho-won; all are Algonquian words for shell beads or string of shell beads. Wampumpeage is a Narragansett word for "white beads strung". Throughout northeastern America, wampum was used for jewelry, gifts, communication, historical record of important events, religious ceremonies, and trade. It was the earliest form of currency known in North America. Its value was derived from the difficulty involved in producing the cylindrical bead from both Quahog and Whelk, and the scarcity of suitable shells. White beads were made from Whelk, purple-blackish from Quahog. The beads were produced from the inner spiral of the shells. The spiral or column must be thick enough to withstand grinding, shaping and drilling. The shells were collected along the coastal shores during the summer, and worked in the winter months. The inner spirals were cut into cylinders measuring 1/4 inch long by 1/8 inch diameter. Each bead was then smoothed through grinding, polished, drilled, and finally strung on hemp fibers or sinew. It was difficult, tedious, and time consuming work. The proportionate scarcity of the Quahog dark beads doubled their value to that of white wampum. She sells seashells by the seashore. If she sells seashells by the seashore, how many seashore shells does she sell? This old tongue twisting pronunciation trainer underscores step one in the manufacture of Wampum. You needed a supply of a certain, special and very attractive type of Calcium Carbonate, which was limited in quantities, to begin to do WORK=ENERGY INPUT plus some ARTISTIC CREATIVITY on the seashells in order to produce a CURRENCY that was BOTH a medium of exchange AND a store of value. In a barter economy, the transfer of goods and services from one party to another is hindered by the lack of liquidity of say, an animal, a bear skin or whatever. The lack of a medium of exchange that can be subdivided into small enough units for both parties to make up perceived different values in a barter transaction is the need that fosters the creation of "money" in the first place. Wampum was initially a form of artistic expression as well as a form of communication (it was a store of value as jewelry and venerable truth through news and agreements). However, as the quantity gradually increased and most natives agreed more or less on its value, wampum began providing the liquidity that a barter economy could not. Consequently the Native Americans along the eastern area of North Amerca gradually adopted wampum as a currency in addition to valuing its beauty (jewelry = bling). The Natives that lived along the beach had an edge on those inland because of easy access to the raw materials. With the influx of more Europeans in the 17th century, notably the Dutch and English, metal tools became widely available to Indians in the east. Among these tools were slender metal drills which greatly facilitated the production of wampum. These new tools enabled the Indians to produce uniform beads more quickly and with greater ease. Applying basic economic principles to wampum as a commodity/currency in the 17th century, it might be assumed that wampum decreased in value as its production was sped up. On the contrary, its value remained stable. Again applying the basic economic rule of supply and demand, though the Europeans brought tools that helped to increase wampum production, they also balanced their contribution with an increased demand for the shell beads. Wampum is pretty and, until the Europeans showed up with metal hand tools, a good store of wealth because the amount of energy=work it took to make it as well as the amount of shells available limited the amount of wampum in circulation. But those metal thingamajigs the white devils brought made it EASY (LESS TIME & ENERGY=WORK) to make lots of pretty wampum (metal hand drills). This new wampum looked just as good or better than the older stuff made with less sophisticated (non-metal) tools. At first everybody prospered. There was more wampum, and contrary to standard economic theory that when you increase the currency in circulation, you get inflation, this did not happen right away. Everybody, including the white devils , were happy with the wampum economy. But time passed and things changed. As the New England colonists adopted wampum as their standard currency, incidents of fraud (wampum counterfeit) increased. Both Indian and Englishman were known to pass off inferior or fraudulent wampum to unsuspecting colonials. 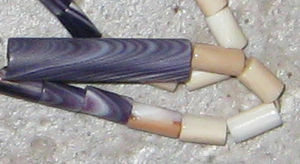 In time, regulation and a standardized measure of wampum strands was implemented. A fathom (6 feet) was the most usual measurement and instantly denoted a specific monetary value measured against English shillings, pence, pounds, and so forth. The fact that legislation was introduced, regulations regarding wampum manufacture were set down, penalties for counterfeit or inferior quality wampum trading were harsh, and in some colonies the rejection of dark wampum for only white (though its value was greater, it was easier to counterfeit by way of dye), all illustrate how dependent the colonists and Indians were on these shell beads. There was some fluctuation in wampum's value, as is always the case with currency, but by and large, it remained uniformly acceptable and desirable to nearly the end of the 17th century in the colonies and into the 18th century along the frontiers. Its worth, however, was tenable. Wampum was only good as long as the Indians prized it. If or when that was no longer the case, an economic crash could occur throughout the English colonies that would have had serious consequences in New England, and subsequently, in the mother country as well. It was this realization, along with the declining demand for fur, that moved the New Englanders to gradually phase out wampum as a currency standard. With silver from the West Indies beginning to circulate in North America, wampum was slowly being replaced by that universally valued commodity, metal coinage. 1) The colonists, who had hitherto absorbed the wampum glut by their demand for the beads, lost interest in wampum partly because they didn't require as many furs (wampum was the currency the colonists used to buy pelts). Wampum lost value as a medium of exchange as the increase in available currency took its toll. Counterfeiting exacerbated the problem of undermining the medium of exchange value of the currency. A given piece of wampum lost purchasing power because of wampum glut AND a competing currency of coinage. 2) The artistic value part of wampum as a store of wealth suffered as well. Any philatelist can tell you that old stamps get their "value", not from a pretty painting on the stamp, but MAINLY from their scarcity. This was depressing. Imagine all those hours spent painstakingly making wampum and that neighboring squaw that is all thumbs can suddenly make several times as much as you can just because she has a white devil metal thingamajig to goose production! And now the white devils don't want them as much as they used to either. But as you can see below, despite its disappearance as a currency, wampum survives to this day as a product of patient craftsmanship, artistry and historical communication. It is interesting, if not ironic, to note that wampum remains valuable even today. 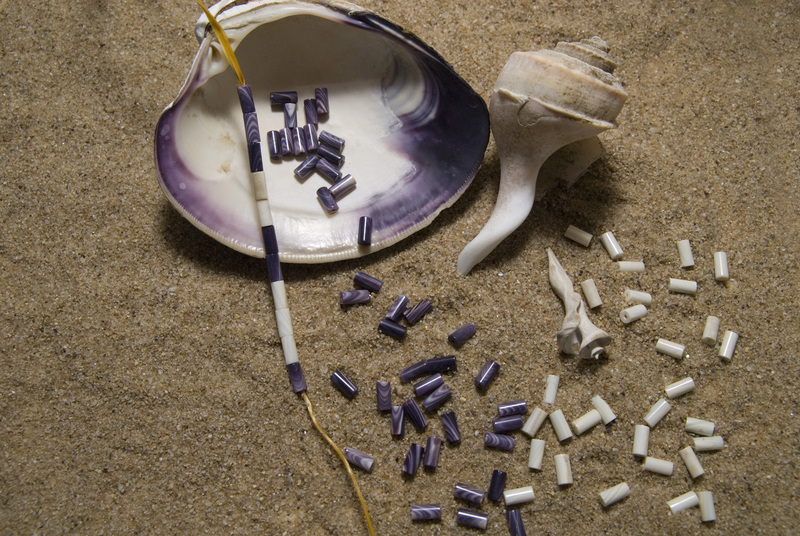 A single wampum bead made from Quahog or Whelk, manufactured in New England coastal areas can cost up to $10! Overseas wampum is less expensive, but still demands a good price. Wampum, the first currency of the new world, has survived as a desired item long enough to be considered a classic. But it would never regain its position as a medium of exchange/currency. Two Row Wampum Treaty from Elder, Yvonne Thomas.pic.twitter.com/EtjkqHsG9o The patient artistry and symbolism crafted in this wampum is an example of how wampum is a store of value. In an effort to maintain a separate and peaceful coexistence, an agreement was made 400 years ago between a group of Haudenosaunee nations and the incoming European settlers who were rapidly arriving. That agreement remains valid today. 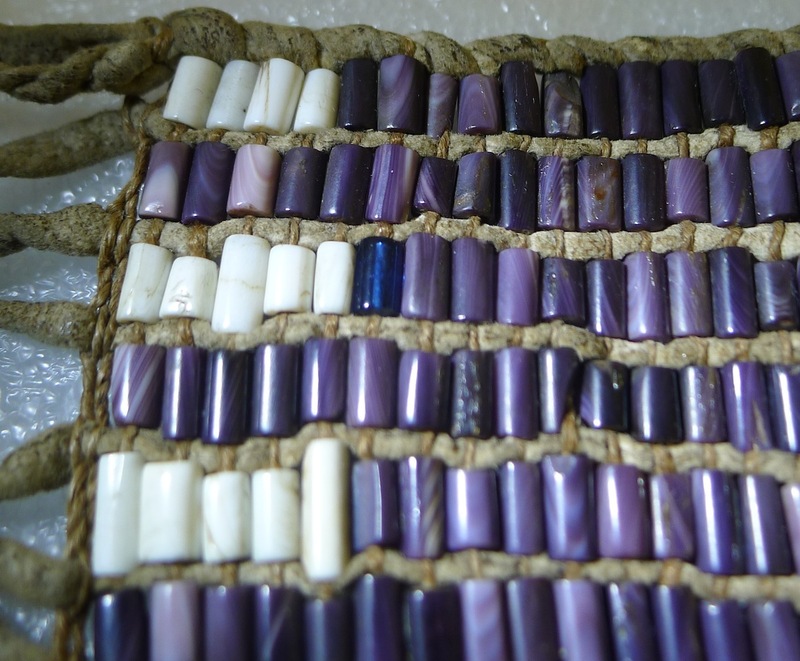 The Two Row Wampum was made with strings of wampum, or crushed shells, which were made into purple and white beads threaded onto strings, forming a belt. ]The white beads, located outside of two large purple rows of beads, represent the truth. The purple beads are separated into two rows, one representing the canoe of the Haudenosaunee, the other representing the sailboat of the incoming Europeans. Each row represents the separate cultures, traditions, governments and religions. In between the purple rows run three rows of white beads. These represent peace, friendship and maintaining a sense of equality forever. What lessons can we take from the above Native American experience? 2) The ENERGY it takes to create said money is directly proportional to a unit of said money as a store of value. The extreme situation, never reached by wampum because it always took SOME skill and energy to make, is FIAT currency where it has ZERO value as a store of wealth. The case of the US dollar is BELOW ZERO as a store of wealth because, in addition to it being fiat, the supply is growing absent any energy input whatsoever. So the dollar loses value as it sits from Fed inflation (counterfeiting). Legal Tender Laws force the citizenry to run around trying to preserve some value in a currency that shrinks in value year after year. Many of these value chasers go for PMs, paintings, land, antique cars, Early American antique furniture, etc. They are all looking for something that meets the criteria of liquidity, durability, portability and agreed upon value per unit to a greater or lesser degree. 3) Beyond the basic biochemical needs of proper nutrition, shelter and health, human culture places a great deal of value on tangibles and intangibles outside the default requirements of human life. Humans will always value creativity and imaginative and useful innovations that bring beauty, comfort and utility to our lives as STORES OF VALUE. What price can you place on a song? What value does a set of verses have that took a song writer 5 minutes to write after he had dreamed them versus a painstakingly written flute sonata? Hard to say, right? One took a lot less ENERGY than the other, both in KWhs and artistic creativity, but may have sold for a lot more money. What about greed and other economy influencing factors? The issue of greed, hoarding, the amount of currency in circulation as a trigger for consumerism or the reverse are all PRODUCTS of distortions in an economy. Most economists espouse the view that currency does not simply encourage certain types of behavior deleterious to an economy, but DICTATES IT. I don't feel that way because I view money as an EFFECT, not a CAUSE. I do agree that the money supply certainly must remain in a fairly constant proportion per capita to avoid distortions. Food will never be currency simply because, even if you could freeze dry it with solar energy and store it also with solar energy for a hundred years or so to use it as you needed it, there is only so much food you or anybody else can eat. People want furniture, tools, culture, beauty, some entertainment, etc. A prisoner in solitary confinement goes bonkers even though he has sufficient food, shelter and health care. Life is MUCH more than food, shelter and health. Gold bugs observe, rightfully, that the US dollar retains the above attributes by the big gun the government has called Legal Tender Laws, not by reality. This amounts to a government distortion of the value of the currency to for the benefit of the owners of the Federal Reserve Banking Cartel and the detriment (i.e. impoverishment) of the average American citizen. Consequently they take any excess dollars in their possession and quickly convert them something besides dollars because the value of said dollars, like wampum (eventually,) after the metal hand drills were introduced by the white devils, is going down. Gold bugs watch the Fed money supply going exponential in direct proportion to the galloping inflation the government refuses to own up to. This is far worse than wampum inflation because this is raw counterfeiting of fiat! People aware of this start to buy this, that and the other with those magically shrinking dollars from collector's items like stamps to maybe antique furniture to paintings to rare coins to, you guessed it, gold! The Federal Reserve Banking Cartel realizes there are a lot people out there on to their game so they start manipulating the precious metals paper prices (tanking them) to drive the gold bugs back to the Fed fiat fantasy of a strong dollar. I observed this blatant and economically disastrous distotion of currency value and, after thinking about it a while, came to the conclusion that we need something like wampum but without those hand drills or the counterfeiting dye! My wonderful and innovative Kilowatt Hour Monetary Standard is, horror of horrors, greeted with hardy harrs and guffaws from the gnomes of the Federal Reserve. Harrumph! ANY currency that is not BOTH a medium of exchange and a store of value will be corrupted, distorted, counterfeited and generally devalued, PERIOD. The "tokens" or other symbols used for such currency obviously introduces DEBT because there might be a whole lot more symbols, tokens or pieces of paper with funny squiggles on them than the ACTUAL store of value represented. THAT'S JUST A DETAIL. If you can avoid corruption and insure transparency, that can be minimized. The "fear" that hoarders are going to trash the economy by taking money out of circulation is unfounded. That's merely an EFFECT of capitalism. It has nothing to do with the concept of money per se. This EFFECT is really quite easy to prevent. All you have to do is progressively tax wealth (NOT INCOME!) above X net worth to keep a lid on excess capital accumulation. Thomas Jefferson was in favor of that, as a matter of fact (google it!). Once everyone is on board with a stable currency like Kilowatt Hour Equivalents, I would also eliminate the difference between earned and unearned income (capital gains) and progressively tax that too. That appropriate and fair tax structure would serve as an additional DETERRENT hoard and a guarantee that the velocity of money will remain fairly constant. The iron curtain of the Supreme Court was breached on Wednesday. Activists from the group 99Rise entered the Supreme Court chamber. After videoing the session where the justice can be clearly seen, one of the activists stood up. He said the following before he was accosted by the Supreme Court security detail. Washington, DC - Activists from the grassroots group 99Rise, entered the Supreme Court of the United States chambers today, disrupted the proceedings, and demanded the restoration of democracy in America. "Generations of Americans have shed blood, sweat, and tears to win the right to vote and extend the promise of democracy in America,” said Kai Newkirk, co-founder of 99 Rise and a participant in today's action, “It's time for our generation to step up and do whatever it takes to defend that right and end the corruption of big money in politics. 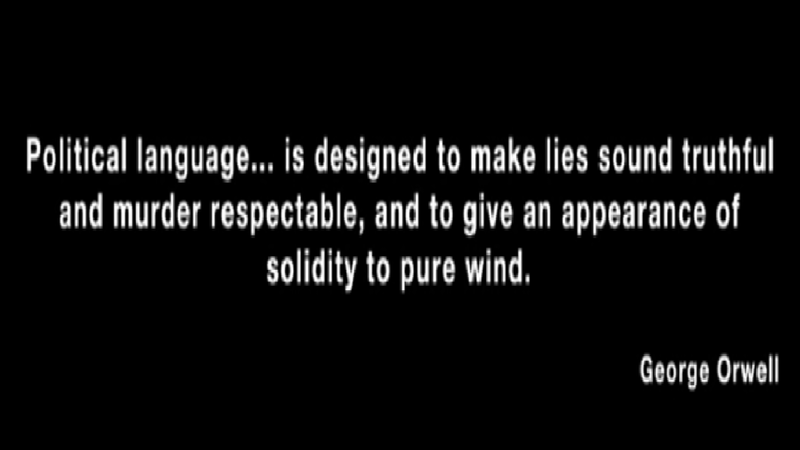 If that means risking arrest in order to speak truth to power, so be it." The participants were inspired to act in response to the recent decisions of the Supreme Court in Citizens United v. FEC, which demolished the wall of separation between wealth and state, and the threat that the Supreme Court would make it even worse in McCutcheon v. FEC, which would remove the cap on aggregate candidate contributions. "The Supreme Court's Citizens United decision was a betrayal of the American people and of our democracy. It took the systemic corruption of our government by big money interests to an obscene new level. If the Court eliminates the cap on aggregate donations by an individual in an election cycle - the question at hand in the McCutcheon case - it would put another round of shots into the dying body of our democracy." The group is calling for a restoration of free and fair elections in America, an end to the corruption in our politics, and the restoration of representative democracy in America. Using nonviolent direct action and civil disobedience, such as was used in the Civil Rights Movement, they have been drawing attention to this issue with actions from coast to coast. 99Rise.org is a grassroots organization fighting to end corruption and win real democracy through nonviolent resistance. For more information, including pictures of previous actions, please visit 99Rise.org. Agelbert NOTE: I will be checking out 99Rise.org. It sounds like a GREAT ORGANIZATION! How Much US Debt Does China Own? The US national debt is more than $17 trillion US Dollars (USD), or roughly equal to the country’s gross domestic product (GDP), and China owns about 7.6% of it, or more than $1.2 trillion USD. China is the largest overseas creditor of the US. Japan is the next-largest overseas creditor, and it owns about $1.1 trillion USD of the US national debt. More than one-fourth of the US debt is actually owed to its own federal government, such as the Social Security trust funds and the Federal Reserve. •The US was created with a national debt; a 1790 analysis estimated that the new country had a debt of $75 million USD, or about 30% of its GDP. •As of 2014, Andrew Jackson is the only US president to get the US national debt completely paid off during his presidency — the country was debt-free from 1835 to 1836. •The US national debt has not been below $1 billion USD since 1866. Agelbert NOTE: There you have it - PROOF that what WE saved in Social Security has been pilfered away by the lying, thieving crooks in our government for corporate war and fossil fuel profiteering. Big Oil OWES US that money! Thu Jun 12, 2014 at 07:33 PM PDT. (Al Jeezera)Researchers at the University of Oxford and the London School of Hygiene & Tropical Medicine have suggested that more than 10,000 suicides in Europe and North America can be linked to the severe economic downturn brought on by the 2008 financial crisis. The study, published in the British Journal of Psychiatry, adds to a growing body of evidence that suggests that economic downturns have serious but somewhat predictable mental health consequences, and that with the right kind of intervention, the mental impact of recession can be reduced. This is about as prestigious a study panel as you could put together and their findings are borne out with five years of hindsight. This economic collapse was brought on by a combination of financial deregulation and unnecessary deficit spending brought on by tax cuts for the rich and the Iraq War. Millions of victims have seen their jobs lost, wages shrunk and homes lost but the greatest price was paid by those who couldn't take any more pain from this class war and chose to give up the ghost. Right, each time food stamp recipients are demonized, lives are lost. In the U.S., the suicide rate increased by 4.8 percent between 2007 and 2010. Canada saw a similar increase. In the EU, where the suicide rate had been steadily decreasing until the recession, it jumped from the pre-recession rate of about 10 suicides per 10,000 people by about 6.5 percent at the start of the downturn and remained at the higher rate through 2011. In Sweden, Finland and Austria for example — where government assistance for the unemployed and clinically depressed is more readily available than elsewhere — the suicide rate remained consistent or saw small reductions despite the economic downturn. It is not a moral paradox. Conservatives are killing people without conscience. The "Pro-Life" Party has blood on it's hands it can never wash off. Watch this one minute clip to learn how Capitalism has FAILED to accumulate and protect the most important Capital, thereby making so called modern "Capitalism" a monstrous system that actually SHRINKS, DEGRADES and DESTROYS Capital! Agelbert NOTE: More proof that Homo SAPdom is dumber than a wedge. Government Control of Money = a SCHEME (i.e. a scam ) to make SOMETHING for NOTHING. Founded in 1791, by the end of its twenty year charter the First Bank of the United States had almost ruined the nation's economy, while enriching the bankers. Congress refused to renew the charter and signaled their intention to go back to a state issued value based currency on which the people paid no interest at all to any banker. This resulted in a threat from Nathan Mayer Rothschild against the US Government, "Either the application for renewal of the charter is granted, or the United States will find itself involved in a most disastrous war." Congress still refused to renew the charter for the First Bank of the United States, whereupon Nathan Mayer Rothschild railed, "Teach those impudent Americans a lesson! Bring them back to colonial status!" The British Prime Minister at the time, Spencer Perceval was adamantly opposed to war with the United States, primarily because the majority of England's military might was occupied with the ongoing Napoleonic wars. Spencer Perceval was concerned that Britain might not prevail in a new American war, a concern shared by many in the British government. Then, Spencer Perceval was assassinated (the only British Prime Minister to be assassinated in office) and replaced by Robert Banks Jenkinson, the 2nd Earl of Liverpool, who was fully supportive of a war to recapture the colonies. Greek good guy tells it like it is. 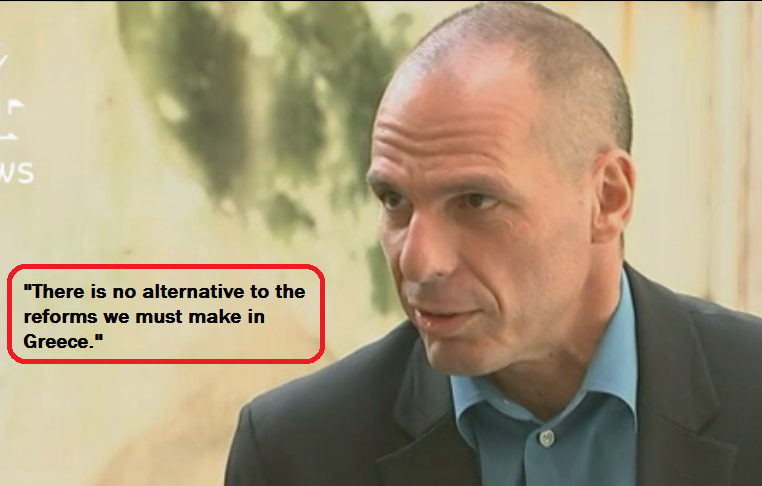 Otherwise, it's CURTAINS for the Eurozone! In a barter economy, the transfer of goods and services from one party to another is hindered by the lack of liquidity of say, an animal, a bear skin or whatever. The lack of a medium of exchange that can be subdivided into small enough units for both parties to make up perceived different values in a barter transaction is the need thar fosters the creation of "money" in the first place. Consequently the Native Americans along the eastern area of North America gradually adopted wampum as a currency in addition to valuing its beauty (jewelry = bling). The Natives that lived along the beach had an edge on those inland because of easy access to the raw materials. , were happy with the wampum economy. 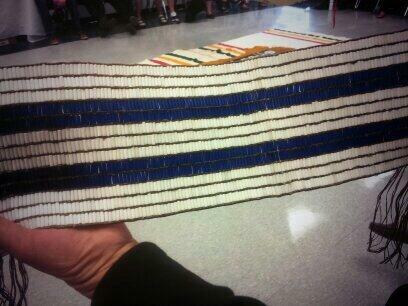 Double row Wampum is beautiful AND still valuable. The white beads, located outside of two large purple rows of beads, represent the truth. I observed this blatant and economically disastrous distortion of currency value and, after thinking about it a while, came to the conclusion that we need something like wampum but without those hand drills or the counterfeiting dye! My wonderful and innovative Kilowatt Hour Monetary Standard is, horror of horrors, greeted with hardy harrs and guffaws from the gnomes of the Federal Reserve. Harrumph! The "tokens" or other symbology that is used for such currency obviously introduces DEBT because there might be a whole lot more symbols, tokens or pieces of paper with funny squiggles on them than the ACTUAL store of value represented. THAT'S JUST A DETAIL. If you can avoid corruption and insure transparency, that can be minimized. Nuclear experiments have successfully transmuted lead into gold, but the expense far exceeds any gain. It would be easier to convert gold into lead via neutron capture and beta decay by leaving gold in a nuclear reactor for a long period of time. Does Being Rich Make You a Self-Centered Lawbreaker? Work by social psychologist Paul Piff suggests that the more money people have, the more likely they are to cheat or put their needs before those of others. In the past, public perception has tended towards the notion that the very poor are more likely to break the rules because they are under financial pressure and face more difficult circumstances. But Piff’s work suggests the opposite - that having more money makes you care about others less and feel entitled to put your own interests first…After nearly a decade researching this field, Piff has come to the controversial conclusion that being wealthy, rather than transforming you into a benevolent benefactor, can actually be rather bad for your moral fibre…“It isolates you in certain ways from other people psychologically and materially. You prioritise your own needs and your own goals and become less attuned to those around you. When we feel wealthy, Piff concludes, we need other people less. In the real world, when people have less money, they rely more heavily on their social relationships to get by. Therefore interpersonal relations are prioritized. The rich, by contrast, can buy themselves peace, quiet and space - plus a solution to most problems. There’s nothing like a fat wallet to cheer you up in a crisis. But that tends to isolate them from others’ experiences. The reason the blinkered, low IQ offspring of the rich get by better than most of us. The meritocracy in the USA is an illusion for the suckers.